Among oil industry experts and officials in Davos, Switzerland, pervasive skepticism about the effectiveness of the OPEC deal in rising oil prices. At the front of everyone’s mind: the rising output from U.S. shale oil rigs. 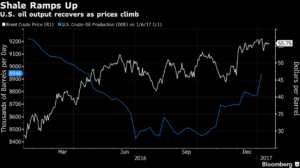 Oil-price gains will trigger a “significant” increase in U.S. shale output as OPEC and other producers rein in supply, according to the head of the International Energy Agency (IEA). 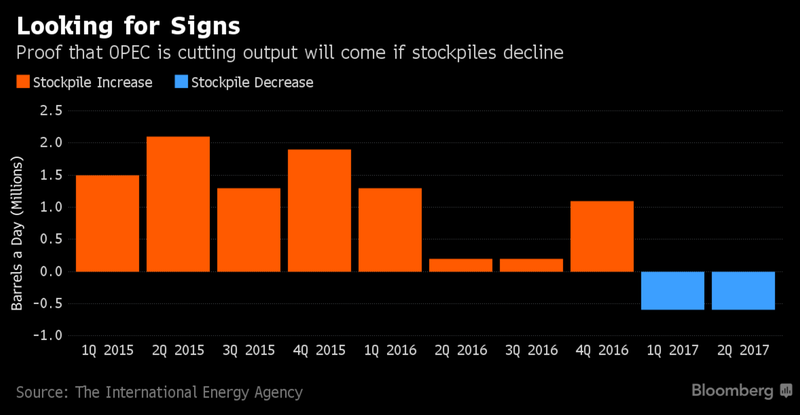 Birol’s comments suggest that the IEA has become more optimistic about the outlook for U.S. production. Previously, the agency said it expected U.S. tight oil — as shale is also known — to rise only “marginally” in 2017. Oil prices have risen about 20% since the Organization of Petroleum Exporting Countries (OPEC) reached a deal to curtail supply last year. The November agreement prompted a surge in activity in the U.S.. 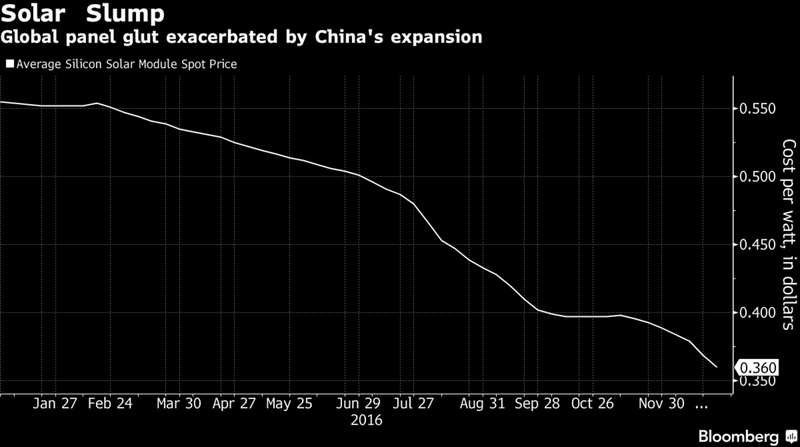 While oil prices have increased more than 20% since OPEC decided to cut production to boost prices, it has also helped bring back more shale drillers who caused prices to drop in the first place due to oversupply in the market. Production in the U.S. has increased by about 460,000 barrels a day, or 5.4%, in the past six months. In response, the EIA recently raised its domestic output forecast for 2017 to 9 million barrels a day from 8.78 million projected in December. Output is projected to increase to 9.3 million barrels a day for 2018. The consistent belief that U.S. shale will keep prices low is bad news for OPEC members and non-members who agreed to cut production to re-balance markets, likely at the expense of their own market share. The Energy Information Administration (EIA) reports that shale oil production is rising strongly in the U.S. and many analysts are forecasting a year of revival for shale. Project approvals are to more than double this year and exploration spending is set to increase for the first time in three years, according to Wood Mackenzie Ltd. 20 oil and gas fields are planned for development in 2017 compared with 9 in 2016, the industry consultant said in a report, while spending on exploration and developing existing projects will increase by 3% following two years of cuts. Beyond 2017, there are still many projects that have break-even costs higher than $60 a barrel, especially offshore. Of the 40 larger deepwater projects up for approval, about half have a rate of return less than 15% at a $60 oil price, according to Wood Mackenzie. This relatively low return for costly, difficult projects could be problematic if prices remain below $60 as expected. Spending is picking up fastest in onshore U.S. operations, unsurprisingly, where companies can respond quickly to higher oil prices thanks to speed of fracking operations and abundance of drilled but untapped wells. Spending on U.S. onshore projects is likely to grow 23% to $61 billion, based on the Wood Mackenzie report. In much of the world outside the U.S. exploration spending is expected to continue to decrease. While the outlook is improving, global upstream spending in 2017 will remain 40% below 2014, Wood Mackenzie said. Project approvals will also be below the 2007-2014 average of 40 a year. So what does that mean for the OPEC push for higher oil prices? How effective the OPEC supply cuts can be if U.S. output rises was always a major concern for OPEC officials. So far, Saudi Arabia’s oil minister, Khalid al-Falih, has voiced skepticism of shale’s potential impact. Speaking at Davos, he observed that oil-field-service providers are renegotiating terms with drillers and are likely to raise the break even price for shale production. Still, slightly higher costs have already been priced in as far as many traders are concerned. And the EIA forecasts that prices for West Texas Intermediate will average $52.50 a barrel in 2017 with output increasing throughout the year. In just the last three months, U.S. petroleum-liquids production bounced by about 350,000 barrels a day (b/d) — more than the output cut promised by Russia as part of its deal with OPEC. At $52.50, the EIA sees U.S. output rising by another 775,000 b/d by the end of 2017. Realistically, a revival for shale drilling in the U.S. is inevitable, but just how badly it tears apart the OPEC deal will be an interesting show. Oil prices appear to be stabilizing, so what does that mean for U.S. shale drillers who survived the price collapse? Today, the price of crude is hovering in the mid-$50’s a barrel range and that is triggering a revival in U.S shale patches that were devastated during the last two years. The good news: U.S. producers are capable of rising production quickly and as output rises so do job numbers. 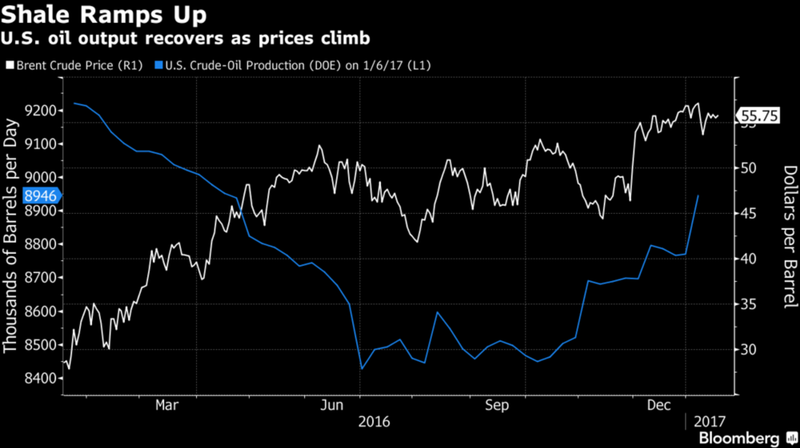 Since OPEC began talks to cut production in November, oil prices have risen by about 25% allowing shale oil drillers to hedge prices for 2017. As a result, the total oil rig count has gone from a low of 316 to 529 in a matter of months. In the past three months, US shale provided an extra 500,000 barrels a day or more than Saudi Arabia committed to cut as part of the OPEC deal. And though the increase is small relative to what was lost over the past two years, jobs have started to reappear and more are expected, according to analysts from Simmons & Co. Reuters reports that they also forecast the number of active oil and gas rigs to average 763 in 2017 and 877 in 2018, from the average 509 in 2016. The bad news: cost saving measures made during the last couple of years may not be sustainable and high US production will put a ceiling on prices. Much of the cost cutting that U.S. producers accomplished in the downturn came at the expense of oil-field-services companies. And as the price of oil has rebounded so have the prices charged by companies that help them tap new wells. The cost of an experienced drilling crew and oil-field supplies has risen between 10% and 20% in the winter of 2016, experts say. From running rigs, trucking water and sand, and providing the labor, the US oil industry is in a time of renegotiation that could send costs surging. Advances in production techniques made drilling wells economic at around $55 a barrel as opposed to $90 just two years ago, however rising prices for supplies and services would increase the price companies need to break even. In Oklahoma’s Scoop formation, one of the cheaper drilling areas in U.S., a typical well can now make money at $51 oil, according to Simmons. But factoring in a 15% to 30% escalation in service costs, those same wells would need between $57 and $63 a barrel to break even, the bank estimates. 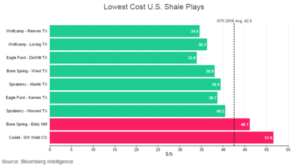 If such an increase in expenses occurs while increased US production keeps prices around $58 as analysts forecast, then all but the best shale plays in the US could struggle in 2017. Still, more than 5,200 drilled-but-uncompleted wells, known as DUCs, stand ready as another option. Those wells could be completed and pumped profitably at $40 barrel, according to Ryan Duman, a senior analyst with consultancy Wood Mackenzie, which allows many companies to keep output up in the short-term. The auto industry is facing not one but two revolutionary changes in the near future: electric vehicles and self-driving cars. As cheaper batteries, lighter materials, and more powerful electric motors continue to improve the range and lower the price of electric vehicles, analysts are at the point of predicting an impending wave of electrification in the automotive industry. 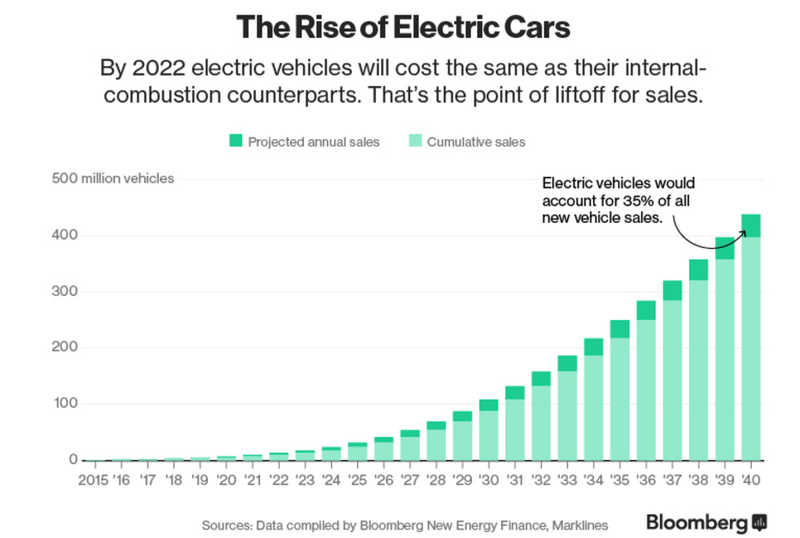 Right now, makers of electric vehicles might be taking a risk accommodating the still costly technology, but in 10 years price and regulations could make electric the only viable option in the market. But while electric vehicles are largely the same as vehicles on the road today, autonomous cars are only being tested in populated areas in recent years and face heavy scrutiny from regulators and the general public. Still, the massive investments traditional car companies and the nontraditional businesses are making in the technology suggest that seeing self-driving cars in daily life is inevitable. Uber has been testing self-driving cars in Pittsburgh; Waymo, the self-driving car unit spin off from Google, is teaming up with Chrysler; Ford is extending Chariot, the van-sharing service; and the examples go on and on. The benefits of the technology are simply too great for businesses to ignore, especially for companies interested in providing ride hailing services. For Uber and Lyft, replacing drivers with computers would reduce the cost of taxi services immensely and create a cheap car service that could be available at all hours. No more worrying about background checks, unions, or all the other expenses that come with hiring people. And as Uber, Lyft and their competitors push for fully autonomous ride-hailing services that cut out the cost of human drivers, they are set to speed the adoption of electric cars as well. Electric cars beat out conventional ones for a number of reasons including fuel-cost savings, easier and safer automated refueling, and better compatibility with computer systems. Autonomous technology will be restricted to urban areas for at least the next few years and could take decades to reach the country where mapping roads is more difficult. Still, whenever cars that drive themselves take off, car makers have made it clear they want a part of the business. Between electrification and autonomous capabilities, the future of the personal vehicle is at a turning point. What that means for drivers, car companies, and society in general will be interesting to see. The EIA expects that 24 GW of generating capacity was added to the power grid during 2016 and that, for the third consecutive year, more than half of these additions come mostly from renewable energy, especially wind and solar. Of the 2016 renewable additions, nearly 60% were scheduled to come online during the fourth quarter when additions are usually high because of timing qualifications for federal, state, or local tax incentives. 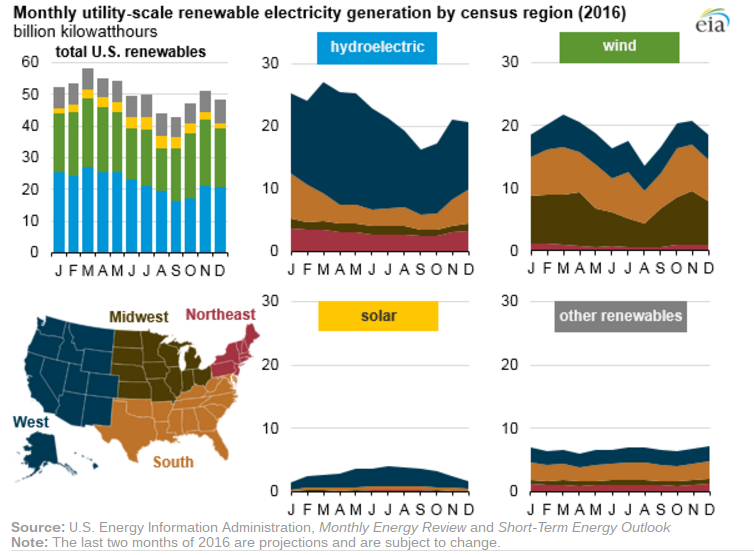 Monthly U.S. renewable electricity generation peaked in March with high hydroelectric and wind generation. Most renewable generation comes from the Western U.S., which accounted for the majority of the hydroelectric (63%) and solar (77%) generation in 2016. Wind generation was more evenly spread across the country with 37% occurring in the Midwest, 35% in the South, 24% in the West, and the remaining 4% in the Northeast. 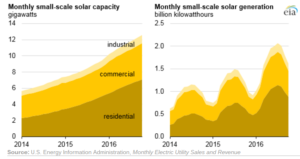 At the end of 2015, EIA also began publishing monthly estimates for distributed small-scale solar photovoltaic (PV) capacity and generation. 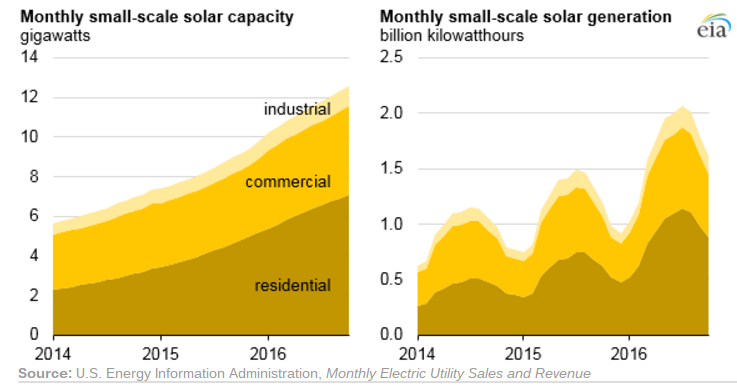 As of October 2016, the United States had a total of 12.6 GW of small-scale solar PV installed. Of this capacity, 56% was in the residential sector, 36% in the commercial sector, and 8% in the industrial sector. Because wind and solar facilities generate power only to the extent their respective resources are available, their capacity factors (ratio of its actual output over a period of time to its potential output if operated at full capacity continuously over the same period) are typically lower than those of other resources. The production tax credit (PTC) for wind and the solar investment tax credit (ITC) were extended at the end of 2015 with bipartisan support. The tax credits include an eventual decline in value for both technologies with the PTC for wind expiring in 2020 and the ITC for large-scale solar declining from 30% to a permanent 10% and expiring for residential projects in 2022. Ten years ago, coal accounted for about 49% of the electricity generated annually in the U.S. This year, the EIA’s December Short Term Energy Outlook has it close to 30%, compared to 34% for natural gas and 5% for wind which both more than doubled their shares of total generation for the same period. Almost 50 GW of coal-fired capacity has been retired since 2010 with virtually no new coal-fired capacity added or planned. On average, the coal power plants retired were more than 50 years old while the average life of such plants is 40 years, according to the National Association of Regulatory Utility Commissioners. That capacity, and by extension the main point of consumption for coal, is expendable for utilities and being replaced almost entirely by natural gas, wind, and solar power assets. Apparently, even if it played a part in moving utility companies away from coal, there are other forces at work besides government regulation. The most likely suspects are changing economics and customer preference for cleaner fuels. Natural gas at least appears cleaner than coal when it comes to CO2 emissions, and natural gas prices are so low in some places that coal cannot even compete on a price basis. With the abundant supplies unlocked by fracking and horizontal drilling, that fact doesn’t look likely to change. As a result, energy generation from natural gas has rocketed upwards at coal’s expense. 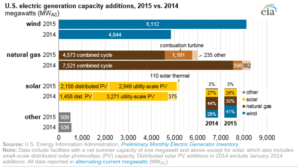 Renewables are also chippng away at coal’s market share. Wind power generated more than 4.4% of the nation’s electricity in 2014 versus 2.3% in 2010 and 0.2% in 2000, and solar’s growth rate and future potential are staggeringly high. 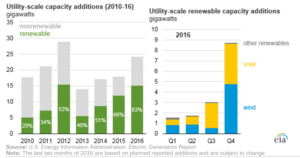 From essentially zero installed utility-scale generation capacity in 2008, operating capacity jumped to 14 GW by the end of 2015 and the latest Solar Market Insight report estimates that more than 10 GW of utility-scale generation will come online this year alone. The Solar Energy Industries Association projects that another 20 GW of capacity will come online by 2020. And as far as jobs in energy, the solar and wind industries reportedly create more jobs than coal each. At least according to the latest census by an entity affiliated with SEIA, there were more than 200,000 solar industry jobs at the end of 2015, 150,000 of which were in installation and manufacturing. In wind, the American Wind Energy Association credits the industry with some 88,000 jobs at the beginning of 2016, of which 21,000 were wind-related manufacturing jobs and 38,000 were project development and construction jobs. Meanwhile, data from the Bureau of Labor Statistics puts the number of coal mining jobs at about 68,000. On top of winning by sheer numbers, many of those wind jobs are located in Republican-led districts. Earlier this year, AWEA released data showing that 86% of all the wind generating capacity in the United States is located in congressional districts represented by Republicans. 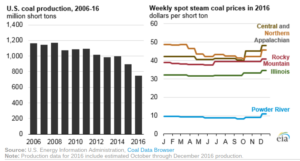 EIA data for the coal industry in 2016 shows U.S. coal production declining significantly, 17% lower than in 2015 and at its lowest level since 1978. Low natural gas prices (see: Natural Gas: Now and Later), warmer-than-normal temperatures during the 2015-16 winter that reduced electricity demand, the retirements of some coal-fired generators (see: The Difficulty of Bringing Back Coal Jobs), and lower international coal demand have contributed to an eight-year decline in U.S. coal production. Nearly all coal use in the United States is used for electricity generation where it has faced increasing competition from natural gas and renewables (see: Power Producers and Clean Energy p.II). The average daily natural gas spot price at the Henry Hub, a key benchmark, fell from $2.63 per million British thermal units (MMBtu) in 2015 to $2.40/MMBtu in 2016, resulting in increased natural gas-fired electricity generation. In 2016, natural gas-fired electricity generation also surpassed coal-fired generation for the first time, accounting for an estimated 34% of total electricity generation compared with coal’s 30% share. 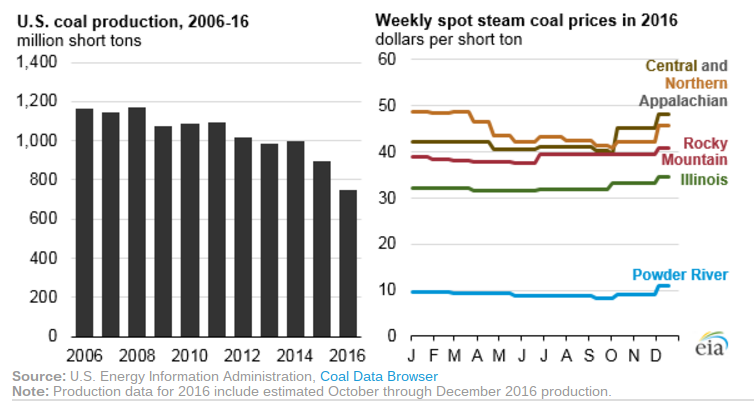 The most recent Short-Term Energy Outlook forecasts total 2016 power sector coal consumption at about 681 MMst, the lowest level since 1985. New generation capacity additions estimated by the EIA for 2016 also show dominance of solar, natural gas, and wind power over other power sources. Coal was expected to have negligible additions. U.S. coal exports also declined in 2016 on the lower international coal demand. Approximately 26 MMst of coal were exported to Europe in 2016, down nearly a third from 38 MMst in 2015. Coal exports to Asia, particularly to South Korea, declined as well. Exports to South Korea saw a 43% decrease from the 2015 level. The EIA estimates that the United States exported 57 MMst of coal in 2016, a 23% decline from 2015. The promise of production cuts from OPEC and its partners gave oil prices a boost in 2016. Now the traders who bought in are waiting to see results. Unlike in the U.S., where output is published weekly, members of OPEC can take months to release production numbers. Even then, their data can contradict independent surveys as most of the group’s members tend to cheat on their deals. Now all the waiting is putting at risk the little optimism left in the market as stories of rising rig counts in the U.S. pile up. Many analysts were skeptical about commitment to the deal from the start. Still, 2017 could see a lack of any serious gains or losses. Market prices already reflect OPEC cuts, and it is unlikely that 2017 will see any more major supply cuts unless Venezuela, the most unstable OPEC member, sees its production vanish all at once instead of in a gradual decline as expected. In fact, because OPEC plans to operate below capacity, there will be plenty of capacity to bring online should something unexpected happens. On top of the flex capacity, bloated oil inventories remain large enough of a price dampener that reducing them is a major goal of OPEC’s intervention according to the group. The IEA estimates that OPEC’s cuts could start to deplete inventories as early as the first quarter of 2017, while OPEC itself says that at best the deal will speed up the re-balancing of the global oil market, only resulting in demand exceeding supply in the second half of the year. According to a Bloomberg survey, analysts are expecting crude prices to average $58 per barrel in the fourth quarter of 2017 with forecasts reportedly closer than usual. Solar power is edging closer and closer to becoming the lowest-cost option for electricity generation in most of the world. 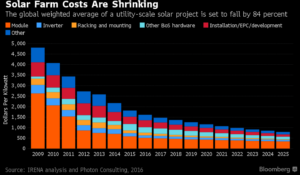 Yet, new lows in costs are being outpaced by falling prices as most solar manufacturers are set to sell their wares at a loss in 2017. Better technology, economies of scale, and manufacturing experience are allowing the solar panel manufacturers to make cost reductions unrivaled by competitors in energy generation. 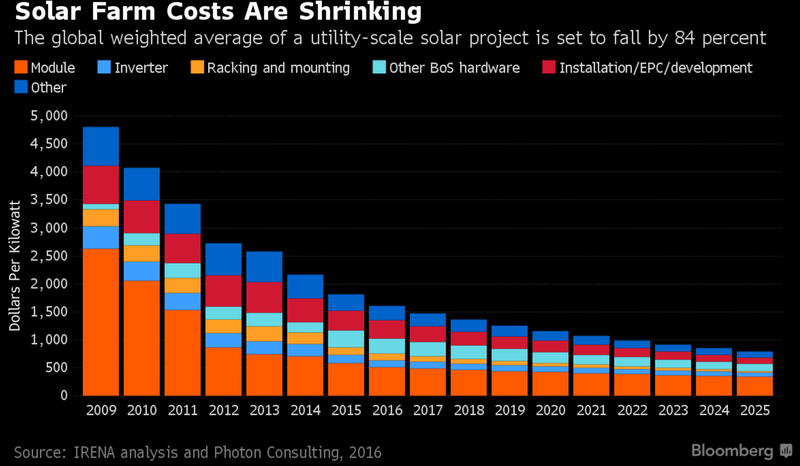 And the International Energy Agency expects utility-scale generation costs for solar to fall 25% on average in the next 5 years with a further drop of 43% to 65% by 2025. 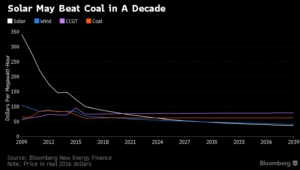 Since 2009, solar prices are down 62% and, by 2025, solar may be cheaper than using coal on average globally, according to Bloomberg New Energy Finance. The falling price of solar is, without a doubt, a positive thing since it means more affordable clean power that can compete without subsidies in at least some parts of the world. The only problem: with such low prices, the companies selling solar panels are going to struggle just to break even. Suppliers are forecasting rapid expansions in capacity this year even as demand is expected to slow and push prices down. On top of possible over-capacity problems, developers keep submitting lower and lower bids to supply solar power. A 2016 August solar power auction in Chile yielded a contract for 2.91 cents a kilowatt-hour. In September, a United Arab Emirates auction yielded another with a bid of 2.42 cents a kilowatt-hour. 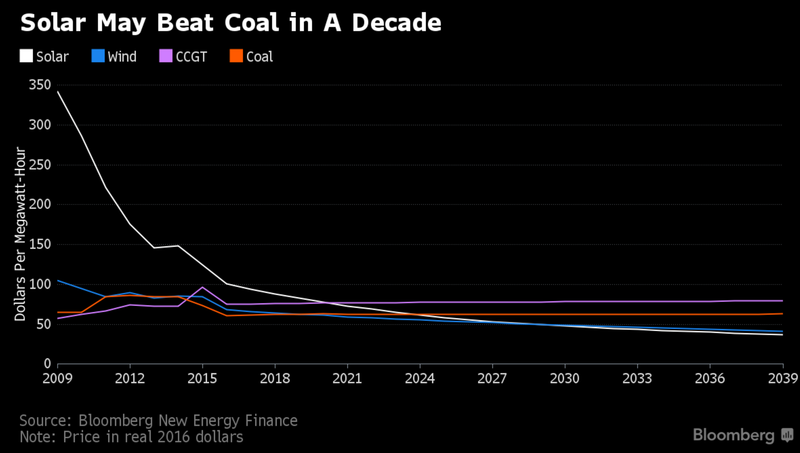 For comparison, U.S. coal power costs about 3.23 cents a kilowatt-hour on average. The cost of solar power has fallen dramatically, but not quite that dramatically. Such bold proposals come on the bet that the cost of the technology will continue to fall fast enough to make such projects profitable. That makes for a risky bet even if solar technology is expected to continue improving. 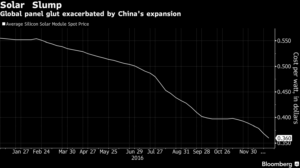 The current prices are already lower than cost estimates from major firms in the industry like Chinese manufacturer, Trina, the biggest supplier of panels in 2015. Yet, some companies’ cost structures remain competitive, even with prices this low. With some of the lowest cost estimates in the industry, Canadian Solar Inc. reported costs of 37 cents in the third quarter, and the company says it expects to reach 29 cents a watt by the fourth quarter of 2017. Not every maker of solar panels will thrive in the next few years, but with Saudi Arabia, Jordan, and Mexico already set to hold their own auctions this year, aiming to drop solar prices even further, companies able to keep costs in line with those prices will at least have an opportunity to do a lot of business. 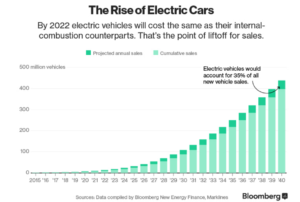 According to Bloomberg, 35% of new vehicles worldwide will be electric by 2040. Clearly, there is a lot at sake and some players in the car market will make the transition better than others. Tesla with its Model 3, hyped as an electric car affordable enough for mass market appeal, seems like an obvious choice for a successful car company in the age of electrification, so long as it can deliver on the 400,000 or so early reservations and keep up the momentum from there. However, Tesla is not the only company making electric cars. For now, Tesla’s futuristic design and brand fits the typical electric car buyer, who tends to be more environmentally- or socially-conscious than utilitarian. That advantage could be lost once Tesla starts trying to sell to customers more concerned with price than perception. If there is one area where big car makers can beat Tesla, its on price, at least as long as they have economies of scale and established supply chains to rely on. Just this year, in direct competition with Tesla, GM plans to release its all-electric Chevrolet Bolt at similar price point. And most other global car brands plan to flood the market with competing electric vehicles by 2020, potentially swamping Tesla in the process. It’s just hard to see how a company that has made less than a million cars in its existence could compete on affordability with those that make millions in a year. On the other hand, Tesla could still win big selling batteries to those companies as it completes its Gigafactory. Still, even if the big car makers take over the electric car market, they haven’t shown they can actually earn the profits they’re used to. The biggest winners of the electric car boom may wind up being the car makers’ parts suppliers. The electrification vehicles brings the concern that components for the engine, exhaust and other functions related to the internal combustion engine will become obsolete. And, sure, suppliers that have invested heavily in hybrid technologies are likely in trouble given that most emissions-reduction strategies are now focused on purely electric vehicles. However, these risks look manageable for the largest players in the supplier realm that can afford to shift into the parts that will matter. After all, electric cars will require their own electronic components for the web-based and self-driving features of the future. In the end, the winners from changes in the car industry may not be car makers but tech-savvy suppliers.